Having two children who felt a bit under the weather over the weekend reminded me of a guest post I did back in the spring over at Home Ever After. 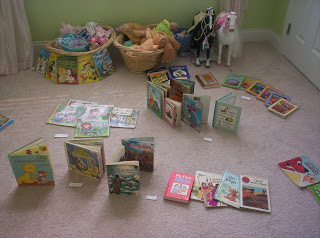 It was entitled 10 Ways to Entertain a Sick Child; you can read it here. Since watching videos and dvd’s is a special treat around our house, the girls were thrilled on Saturday night when they got to lie on sleeping bags on the living room floor to watch an animated Balto video we had checked out of the library. They also spent a good deal of time reading books. 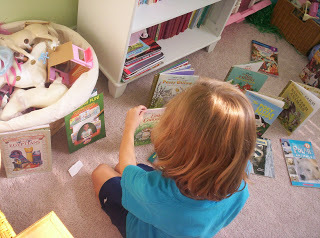 You could tell they were feeling better on Sunday afternoon when they pulled a pile of books off of their bookshelves, divided them into groups by subject and created their own library, complete with library cards and an “Informashin” desk! Does your child have a favorite activity when he’s sick or does lots of extra “cuddle time” do the trick? Leave a comment and share with us how you keep your sick child entertained. Thanks for stopping by and commenting on my blog! Your girls are beautiful! Sick time at our house is staying in pj's all day, watching cartoons/videos, and lots of cuddling. Your girls are too cute to make their own library! 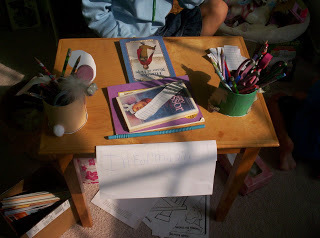 The "Informashin" desk is great! !